Solid steel core A and D with steel rope core G and C. The Soloist series has more projection. Larsen A and D are commonly used with many different G and C strings. The fractional sized strings are one of the only professional level strings for small instruments on the market. 4/4 Wire Core G and C are discontinued. 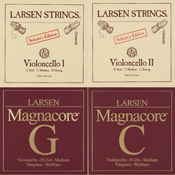 However, Larsen has introduced Arioso, which is a newer low tension G and C.
Magnacore G and C strings represent the first serious challenger to Spirocore Tungsten. These strings offer the powerful and responsive appeal of Spirocore tungsten, but are distinct in that they break in quickly, and have none of the harshness when they are new.